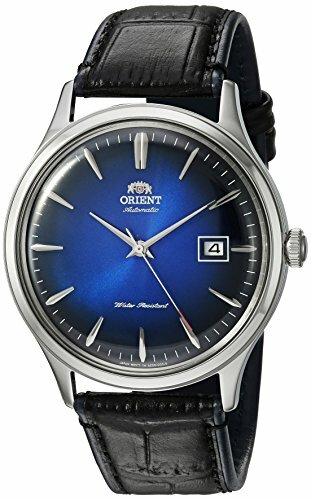 Orient AC08004D Bambino 4 men’s automatic watch features a 42mm wide and 11.8mm thick solid stainless steel case with a fixed bezel and textured push-pull crown. Orient AC08004D is powered by an accurate Japanese F6724 automatic movement with 22 jewels. This stylish watch also features a sharp looking blue gradient dial with silver tone luminous hands and index hour markers along with the 40-hours power reserve and date display functions, scratch resistant domed mineral crystal and water resistant to 30 meters.